Gladiator is a 2000 epic film directed by Ridley Scott, starring Russell Crowe, Joaquin Phoenix, Connie Nielsen, Ralf Moeller, Oliver Reed, Djimon Hounsou, Derek Jacobi, and Richard Harris. 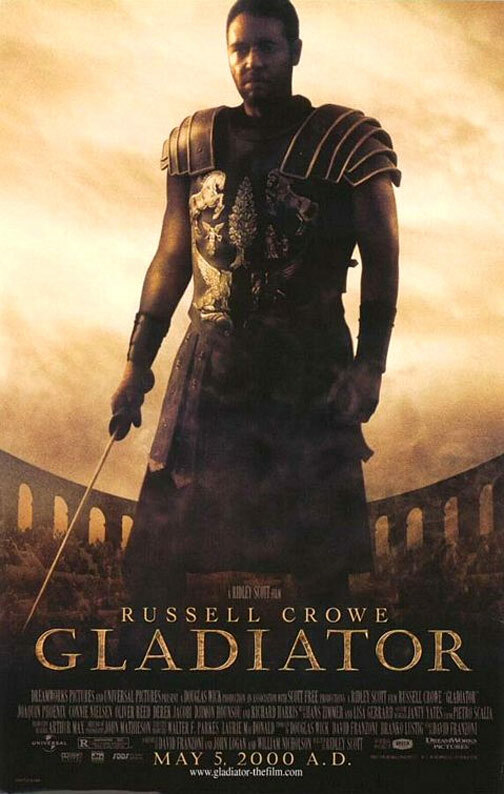 Crowe portrays the loyal General Maximus Decimus Meridius, who is betrayed when the Emperor's ambitious son Commodus (Joaquin Phoenix) murders his father and seizes the throne. Reduced to slavery, Maximus rises through the ranks of the gladiatorial arena to avenge the murder of his family and his Emperor. In the final days of Marcus Aurelius' reign, the aging emperor arouses his son Commodus' anger when he makes known his wish that Maximus be his successor. Power-hungry Commodus kills his father and orders the death of Maximus. But the latter flees and hides his identity by becoming slave and a gladiator. 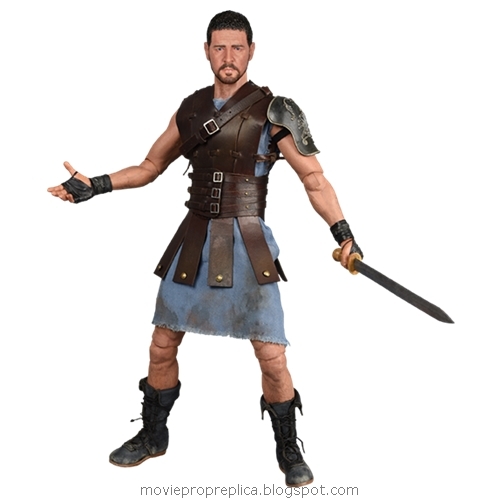 Eventually, Maximus journeys back to Rome to confront his arch-rival. 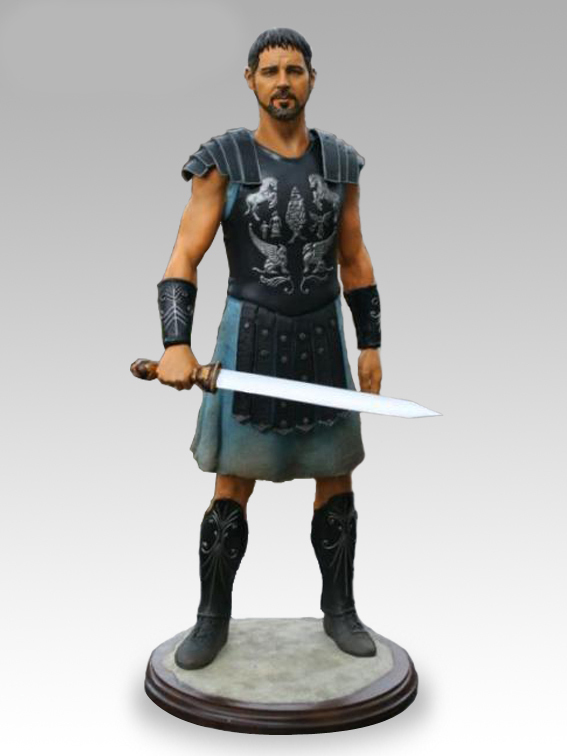 Gladiator Movie Prop Peplicas, Figures, Toys and Collectibles! Russell Crowe as Maximus Decimus Meridius: a morally upstanding Hispano-Roman general in Germania, turned slave who seeks revenge against Commodus. He had been under the favor of Marcus Aurelius, and the love and admiration of Lucilla prior to the events of the film. His home is near Trujillo. After the murder of his family he vows vengeance. Maximus is a fictional character partly inspired by Marcus Nonius Macrinus, Narcissus, Spartacus, Cincinnatus, and Maximus of Hispania. With the roar and spectacle of the Roman Colosseum, comes this piece from The Movie ''Gladiator.'' 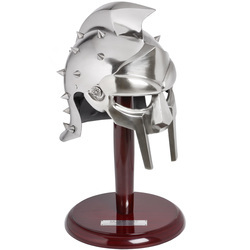 This helmet is a exact reproduction of the one used by Maximus when he fightsin the arena--His fighting disguise in the Colosseum. Manufactured of 18 & 20 gauge steel. Adjustable leather liner. Each piece comes with a wooden display satnd, which enables the collector to proudly display this helmet in either office or home. Approx. 10 inches. Russell Crowe as Maximus Decimus Meridius: a Hispano-Roman legatus forced into becoming a slave who seeks revenge against Commodus. He has earned the favor of Marcus Aurelius, and the love and admiration of Lucilla prior to the events of the film. His home is near Trujillo in today's Province of Cáceres, Spain. After the murder of his family he vows vengeance. Maximus is a fictional character partly inspired by Marcus Nonius Macrinus, Narcissus, Cincinnatus, and Maximus of Hispania. Joaquin Phoenix as Commodus: The corrupted, twisted and immoral son of Marcus Aurelius, he murders his father when he learns that Maximus will hold the emperor's powers in trust until a new republic can be formed. Connie Nielsen as Lucilla: Maximus's former lover and the older child of Marcus Aurelius. Lucilla has been recently widowed. She resists her brother's incestuous advances for she hates him, while also having to be careful to protect her son, Lucius, from her brother's corruption and wrath.